Vomiting is a condition which is marked by throwing up the contents of the stomach. This occurs as the contents of the stomach goes indigested or do not settle in the stomach. It may be a onetime event which is often due to indigestion or over eating, especially oily food. However recurrent vomiting may be due to some other stomach illness, stress, food allergy, food poisoning or any other medical condition like cancer, gastritis or liver diseases. In these later conditions immediate doctor’s advice should is a must. 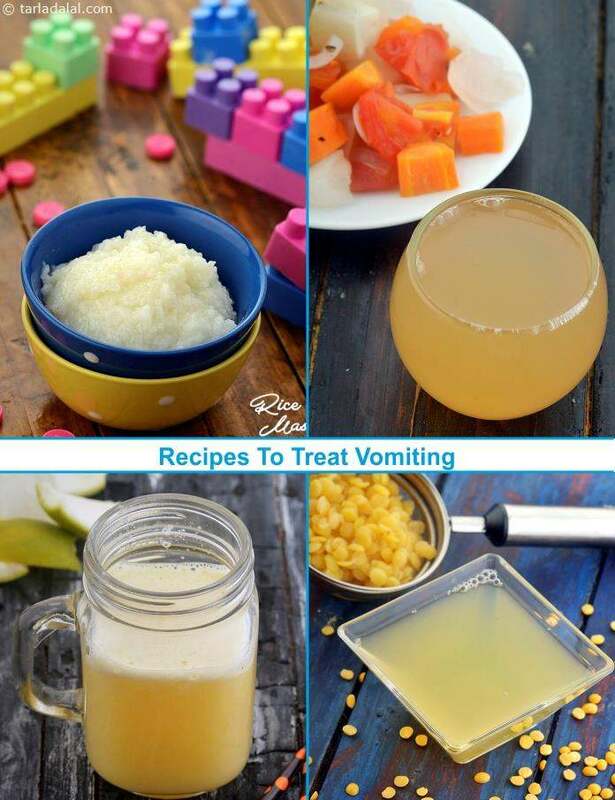 The suggested diet for vomiting is to sip on clear liquids like juices for the first 4 to 6 hours, followed by clear soups and strained water and eventually follow a bland BRAT (Banana, Rice, Apple and Toast) diet. Here are a few quick dietary tips to help you ease vomiting to great extent. • Sip on liquids in the beginning and give your stomach some rest. Try clear soups like Vegetable Broth, plain juices like Strained Sweet Lime Juice, Homemade Strained Apple Juice Recipe or Homemade Strained Barley Water Recipe. • Simultaneously, hydrate yourself very well with at least 8 to 10 glasses of water in a day. This helps to maintain the water and electrolyte balance in the body. Sip on them slowly and gradually increase the amount of fluids. • Banana is your best friend when vomiting. Have small bites of banana and eat at a very slow pace. It is a good source of potassium and help in rebalancing it’s levels after vomiting. • Other bland foods like potatoes and plain Rice Mash are good options too. • Prefer dry foods like toast or cracker, as they are bland and will help you ease the vomiting sensation. • Pass on spicy foods or foods with strong odour like onions and garlic. • Shun off the fried foods and tempered foods completely. • Stay steer of coffee, tea, alcohol and carbonated beverages. • Skip the canned and processed foods. This may further upset your stomach. • Do not eat in a hurry and prefer only small meals. • Do not lie down immediately after having a juice or eating. Rest for a while with your head elevated. • Avoid eating raw salads. • Preferably shun off milk and other dairy products. • Extremely cold or hot beverages are best avoided. • Sweets, mithais and desserts are definitely not recommended. • Do not eat in a closed room. Opt for natural air. These recipes have specially been designed to suit your stomach. Try it and share your thoughts below.